As an expert in statistics, you understand the value of an education in statistical science. Fortunately, more students are beginning to see the value, too. The number of students earning bachelor’s degrees in statistical science nearly doubled between 2009 and 2013, according to the National Center for Education Statistics. That’s great news, but it’s still not enough to fill the many jobs that require expertise in statistics. A report by McKinsey Global Institute predicts the U.S. will need up to 190,000 new professionals with analytical skills to help manage the Big Data movement and run data analytics and business intelligence operations in the private and public sectors. And it’s not just big data that’s driving it—it’s many types of statistics jobs in all areas of the economy. What can you do as an educator to encourage more students to study statistics? 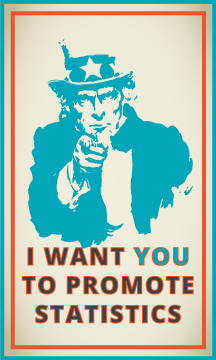 First, help the American Statistical Association spread the word about this campaign. If you are at the university or college level, please share this website with your colleagues within and outside of the mathematics or statistics department. Help students at your institution discover the excitement and power of statistics. The American Statistical Association also has prepared a promotional toolkit to help statisticians in academia, industry, the nonprofit sector and government promote the field of statistics. The following materials may be used at high school or college career days, academic department open houses, employer information sessions, or other events where students gather to learn about fields of study and careers. Fact Sheets about careers in statistics. This series of fact sheets feature some of the most important information about careers in statistics. Post the one-page fact sheet on a bulletin board and hand out the two-page fact sheet at events. PowerPoint presentation. Speakers can deliver this presentation to show how exciting and important the field of statistics is and how it has grown in recent years. Talking Points for each of the PowerPoint slides. This can be used as an aid in delivering the PowerPoint presentation. The talking points also can be used as a standalone speech if the speaker does not wish or is not able to use a PowerPoint. Video Library of This is Statistics campaign videos. These can be streamed on-demand at www.YouTube.com/ThisisStats. For more information on how to use these materials, download the Promotional Toolkit Guidance document. If you are an elementary, middle-school or high-school teacher, how do you get kids interested in the potential of statistics at a young age? One way is to have them analyze their own data and compare it with data of other students their age from the United States and across the world. That’s what the Census at School program does. The Census at School Program is sponsored by the American Statistical Association and is administered by teachers all over the U.S. and several countries overseas, including the United Kingdom, New Zealand and Japan. Here’s how it works: Teachers give their students a 15-minute online survey that is completed anonymously. It includes questions such as what is your height, favorite subject in school, and length of commute to school. The answers to the survey are available immediately and can be used to teach statistical concepts, data analysis, graphing and measurement. Students can also compare their data with that of other students across the world. Learn how to bring the Census at School program to your classroom at the American Statistical Association website. Thousands of teachers rely on the American Statistical Association’s publications, workshops, and webinars to stay on top of the practice of statistics, from learning of breakthrough applications to exploring classic and contemporary thinking about various aspects of statistical education, including the Common Core and statistics. Explore ASA’s teaching tools and resources. ASA also recently introduced a new resource for teaching introductory statistics called “Stats 101.” The toolkit is composed of a series of case studies that show statistics in action, rather than as a branch of mathematics. Each case starts with a real-world problem and leads the reader through steps to explore the problem, highlighting the techniques used in introductory or AP statistics classes. Visit the “Stats 101” toolkit. Statistics Teacher (ST) is an online journal published by the American Statistical Association – National Council of Teachers of Mathematics Joint Committee on Curriculum in Statistics and Probability for Grades K-12. ST supports the teaching and learning of statistics through education articles, lesson plans, announcements, professional development opportunities, technology, assessment, and classroom resources. These days, more than ever, statisticians and journalists share a common mission, especially when it comes to the promoting the importance of evidence and data in a world increasingly complicated by social media. While statisticians and journalists are not usually natural partners, this is not the case with Stats + Stories, a podcast developed by Miami University. This podcast looks at “the statistics behind the stories and the stories behind the statistics” with Miami department chairs John Bailer, from statistics, and Richard Campbell, from the media, journalism & film department. Guests have included network television executives, sports reporters, environmental researchers, data journalists and statisticians in a variety of flavors. Stats + Stories episodes can be used to illustrate the role statistics play into understanding the world around us and the variety of fields where statistical skills are essential. Episodes are currently released twice each month and available at www.statsandstories.net and on iTunes. The field of statistics is evolving and growing in ways few imagined even 20 years ago. These changes are driving interest in curriculum guidelines for undergraduate programs in statistics. The American Statistical Association is leading a working group to address this topic, including what we can learn from some of the leading statistics programs, new skills and capacities needed for an increasingly data-centric world, and how to prepare statistics majors for graduate study. Join the American Statistical Association in these conversations with your peers. Learn more here. The American Statistical Association partnered with The New York Times Learning Network to help students understand and explore statistics through the newspaper’s reporting. On the second Tuesday of every month, you will see a new feature, titled What’s Going on in This Graph? 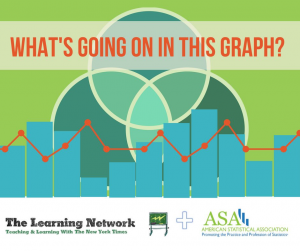 Together, the Learning Network and ASA will select an infographic from The New York Times, strip it of key information, and invite you to use math, statistics and critical thinking to answer questions about what you see. It is a fun way to see problems in a new way. At the end of each week, the graph’s title, caption and additional details will be revealed, along with related statistical concepts and helpful vocabulary. To find the latest “What’s Going On in This Graph?”, visit this page.